The most popular western myths about Chinese culture, surround the practice of foot-binding and embroidery stitches called the "forbidden" and/or the "blind stitch. The belief in these myths are widely held and persistent in western sociaties. Myth: Chinese women with bound feet belonged to the upper classes and were carried everywhere. Facts: The practice of foot-binding went on for 900 years and was practiced by all classes of Chinese woman, rich, poor, urban and rural. My favorite pair of lotus shoes were clearly made and worn by a peasant woman. She obviously walked everywhere. 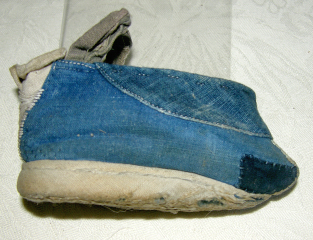 The shoes are plain, unadorned, patched, and the soles are worn through in places. However, most of the Ethnic Minorities did not practice boot-binding. Myth: Red lotus shoes were worn only by the bride for her wedding. Fact: Sorry to disappoint again, but the Chinese giggle when asked about the truth of this one....Red is a very popular Chinese color and red lotus shoes were made and worn whenever the woman wanted to use them. Fact: The Chinese government never became involved with Chinese embroidery techniques. The term "forbidden stitch" has no meaning in China, except for those few dealers who have heard the term from Westerners. There is speculation that early Westerners used this term in reference to embroidery stitches which were used extensively on garments and textiles seen in the "forbidden city". As used by Westerners, the stitch is a Chinese variation of the embroidery stitch sometimes known as the "French Knot" or "seed stitch". Note the contrast in the texture of the embroidery of the pink and red rose peddles and the "satin stitch" leaf peddles.